“Books and Mud” showcases the collaborations and innovation in historic preservation arising from the catastrophic 1966 flood. In November, 1966, the water of the Arno River in Florence rose to record heights, breaking its embankments and flooding the city. Medieval and Renaissance-era cultural treasures stored in library and museum cellars steeped for days in water, mud, and sewage. In an unprecedented international effort, volunteers converged on the city to rescue these priceless works. 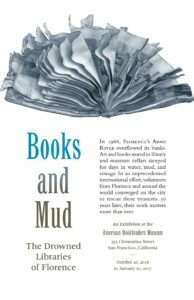 “Books and Mud: the drowned libraries of Florence,” an exhibition at the American Bookbinders Museum, will celebrate these “Mud Angels” and the tools and techniques that were created to reclaim and restore hundred of thousands of books and documents devastated by the flood. Through photos, historic book models, demonstrations, and the words of volunteers from Florence and around the world, the exhibit will communicate the nature and scope of the flood’s destruction. The challenges of retrieving books and documents from heavily flooded storage areas, and the techniques invented and improvised during salvage and recovery in Florence, will be made real for visitors. Many of these techniques and processes continue to be used and refined today in cultural institutions’ disaster preparedness and conservation programs throughout the world. The American Bookbinders Museum will also be working with the Istituto Italiano di Cultura of San Francisco, which is creating complementary events to celebrate the anniversary of the Arno flood. The lessons of Florence become crucial in a world in which climate change is a growing factor. The 2016 floods in Paris, Virginia, and Louisiana, underscore the importance of disaster preparedness for libraries and museums world-wide, and of techniques to restore and conserve the treasures they contain.